My 20 gal. aquarium looks pretty bare, have 6 guppies and a piece of driftwood, 2 plastic plants - can anyone recommend a hearty plant species?Thanks in advance. If you have a decent light, look for low-light to medium light plants, my amazon swords are flourishing, as is the java fern, you tie it on to the driftwood, it looks natural and does well in low light conditions, also cryptocorne species also do well in low-light conditions. Avoid red-leaved plants as they need more light than 1 bulb can provide. 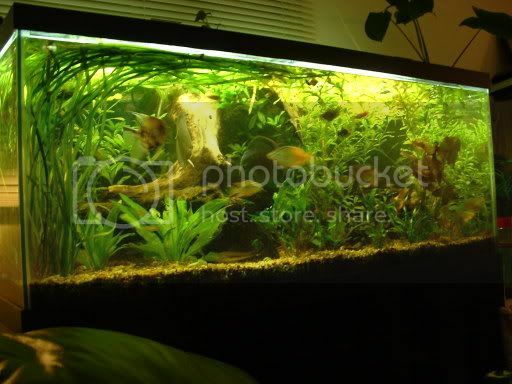 The bulb to use is flora-glo or aqua-life I believe, they are both good for planted tanks. 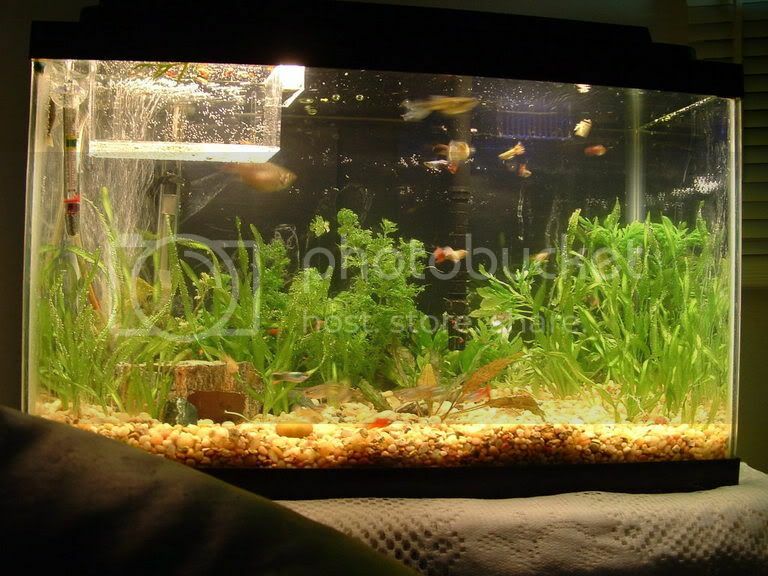 Java moss is another plant that does well and also water onion, these are most of the plants I have in my 25 gal. tank. Plants that I have had no luck with were vallisnera grass, and the hygrophilia that seems to want to be a floater. I also tried a stem plant that looked like anubias but wasn't, it didn't do to well in my tank. Keep the level of iron up or your plants will begin to turn invisible. Once you put plants into your tank you'll find your tank is so much more enjoyable to look at as it looks more natural and the fish really like live plants over plastic ones. Enjoy!! Fins, Fur or Feathers I gottahavepets! Thanks so much for your expertise. Am going to Big Al's this week to purchase your suggestions. One other thing: I presently have 2-25w bulbs, do you think I need the flo-glos or aqua-life bulbs to sustain the plants? compact flourescents, or long strip flourescents. If the lighting is flourescent you are fine. and what you want, and also what type of fish you have. There are also some tricks to plant a tank. type of equipment, filter intakes, heaters, etc. Try to aim at plants that mature to 14 inches or less. nursery, and if anyone knows plants, its tropica. of nature plunked into an aquarium. OMG! I thought my tank looked pretty good but wow! Those are awesome! I think I should invest in a few more things for my tank like a double bulb hood so I can add better plants and a submersible heater as well. The one I have came with the tank and it does ok, but I think the plants may be getting cold feet since I pulled up the U.G. filter. Sneaky you are a guru for sure, you are wise in the ways of the fish, let me be your padowan(?) Show me more I'm all eyes and ready to learn. Word of the wise- plants bring in snails!!! I got plants last summer and ended up with a huge snail problem. I bought some for a different tank a couple months ago and washed very well to make sure there were no snails and now.... huge snail problem again!! I would HIGHLY recommend keeping plants in a separate tank for a while to make sure no snails turn up. One day you will see one, next week there will be one hundred. As for types, generally darker green plants can withstand lower light. Redish plants need higher light. at all, such as ambulia or wisteria. Alum. This will kill the snails and their eggs, without harming the plants. 2-3 days is usually a good enough soak.